Chapels have played a significant part in the recent history of Glamorgan. Amongst our 75 75th accessions are the records of the Mid Glamorgan Mission of the Wesleyan Methodist Church (1998/75), and those of Seion Baptist Chapel, Cwmaman, Aberdare (2013/75). These are just two of many chapel archives held with us. Chapel records can include registers of baptisms, marriages and burials; membership records; annual reports; minutes of meetings; accounts; building plans; Sunday school records; photographs; records of chapel societies such as the Band of Hope… the list goes on and on. 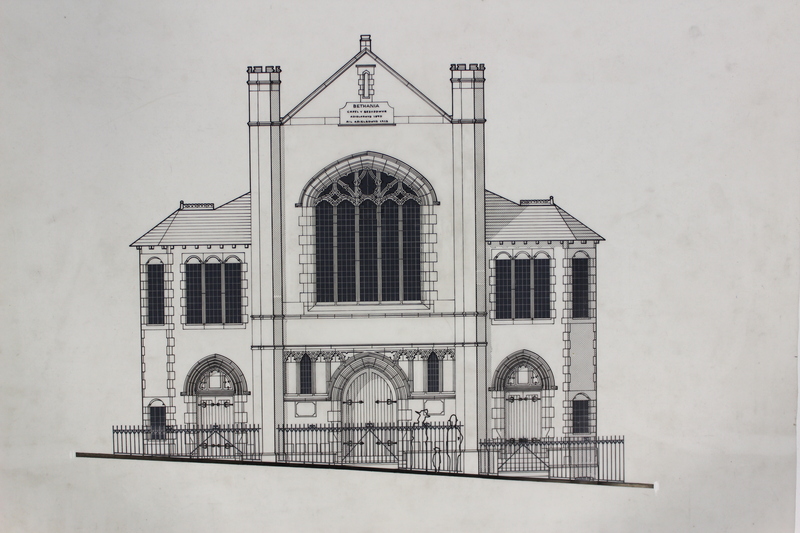 Glamorgan Archives also holds the Mid Glamorgan Chapel Survey (ref. : MGCC/CS). Compiled by the Planning Department of Mid Glamorgan County Council during the 1970s, the survey details every chapel in the Mid Glamorgan area at that time, and includes survey forms, front elevation drawings and plans of the buildings, brief histories and photographs of the chapel, along with additional notes and correspondence relating to the survey. Many chapels across south Wales have closed in recent years as congregations dwindle. Unfortunately, their records don’t always reach us here at Glamorgan Archives. If you are involved in a local chapel – be it a thriving cause or one that is struggling – please don’t hesitate to contact us for advice and guidance on the preservation of your documentary heritage.